We are leading organization, actively engaged in offering a varied range of Wall Primer that meet on customer’s demand. We are familiar with latest developments and innovative machines of this industry and indulge in providing an encompassing spectrum of Epoxy Primer. Besides this, our product is based on latest trends and provides elegance to the rooms. Surface of Application: Mild steel,Free from any kind of Contamination. "We are looking inquires from Mumbai, Navi Mumbai, Thane, Panvel, Vashi, Kalyan, Dombiwali, Nashik, Kasara "
PolyPrime Epoxy is suitable for priming concrete surfaces prior to the application of any epoxy floorings and coatings. 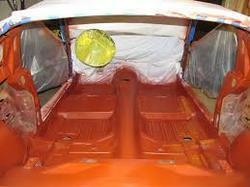 It is two component epoxy based primer with good penetrative properties. PolyPrime Epoxy LB is suitable for wall priming. Recommended as a topcoat for Original Equipment Machines, Hygienic, Maintenance painting, where mild protection along with good decorative finish are required.